The banner was congratulating graduating students. THAILAND’S PREMIER UNIVERSITY has apologized for displaying a banner that showed Adolf Hitler alongside Superman and other superheroes. School officials say it was painted by ignorant students who didn’t realize Hitler’s image would offend anyone. It was hung outside the art school of Chulalongkorn University for this year’s graduating class. In a statement, the dean issued a “sincere apology” from the university. The banner was up for two days and taken down on Saturday in response to criticism. Online photographs showed graduating students in their robes, mimicking the image of Hitler with one arm raised in the Nazi salute. Email “Thai university apologizes for putting Hitler and Superman on banner”. 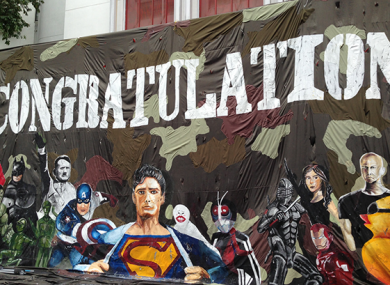 Feedback on “Thai university apologizes for putting Hitler and Superman on banner”.